The New Generation Power Supply (NGPS) is a set of power converters for high-tech applications such as particle physics and medical accelerator magnets. Combining the technical expertise of OCEM Power and our partner CAENels, the NGPS utilizes a 0-FLUCS technology DCCT to achieve high efficiency, low noise, and long-term stability in a single 19”-3U converter. Combined FPGA-DSP-ARM technology used with the current and voltage control loops allows the device to obtain the desired dynamic results no matter what type of load is connected to the power unit. The NGPS’s architecture also allows elimination of a precision DAC board and power amplifier, resulting in fewer components, increased reliability and reduced noise. Output ratings are customizable upon request. 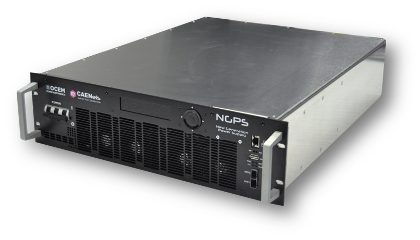 The NGPS can be used as a building block for a larger, more powerful system still operating as a single unit with a single communication interface. The power converters can be connected by configuring a master device and multiple secondary devices, with the parallel connection taking place at the output terminals and the units “communicating” via the front panel’s SFP interface. This allows for a higher power rating without affecting the stability or TC. Temperature stabilizier: The NGPS has an internal temperature stabilizer that makes ambient temperature variations almost negligible, with a temperature coefficient (TC) of less than 0.0001%/ degree C.
Interface: The unit’s standard fast interface of 10/100/1000 TCP-IP Ethernet (10-kHz update rate) provides industrial reliability and performance. The embedded Linux OS allows direct implementation of customer routines and scripts on the unit, and provides maximum flexibility as well as high-level interfacing with the external world. External trigger signal: An external trigger signal fed through a BNC connector on the rear side allows the NGPS to be synchronized to external events. Remote sensing terminals: Remote sensing terminals maintain consistent voltage by compensating for external voltage drops when the device is running in constant voltage (CV) mode. 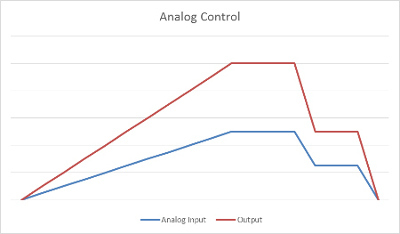 Ancillary analog input: An ancillary analog input rated at 0 to 10 V allows compatibility with older systems that use a DAC to control the power, enabling users to gradually upgrade from older systems to the newer one. Waveform: Current and voltage waveforms can be pre-loaded point-by-point and executed as needed. This feature is especially useful because it improves reliability on timings where ramping is necessary.